When discussing energy efficiency in refrigeration systems, the mantra is typically “lower lift equals lower energy”. However, in some cases the energy penalty required on other parts of the system to achieve this lower lift across the compressors is greater than the energy reduction at the compressors. While performing verification on an ammonia refrigeration system in the Pacific NW, Energy 350 discovered a prime example of this situation. The installed system was upgraded to allow floating head pressure controls based on a user defined wet bulb approach set point. The system was originally set to operate with an approach set point temperature of 9°F between ambient wet bulb and saturated condensing temperature. This was done with the intention of the lower condensing pressure resulting in energy savings at the compressors. However, it was observed that during periods of low wet bulb (but not low enough to achieve minimum head pressure), the condenser fans were operating at higher speeds than expected. Review of trended data from the control system showed that the 9°F approach was not able to be achieved, and the fans were operating at an unnecessarily high speed as a result. This is because the fans were trying to attain a head pressure that was unattainable given the effectiveness across the heat exchange area at the evaporative condenser due to the ambient wet bulb temperature. Note that in the chart below, the fan speed is highest at night, when wet bulb is lowest. This is a result of attempting an approach that the condenser cannot achieve under these conditions. After discussing this with the customer, they agreed to adjust the approach set point to 12°F to allow for greater savings at the fans. 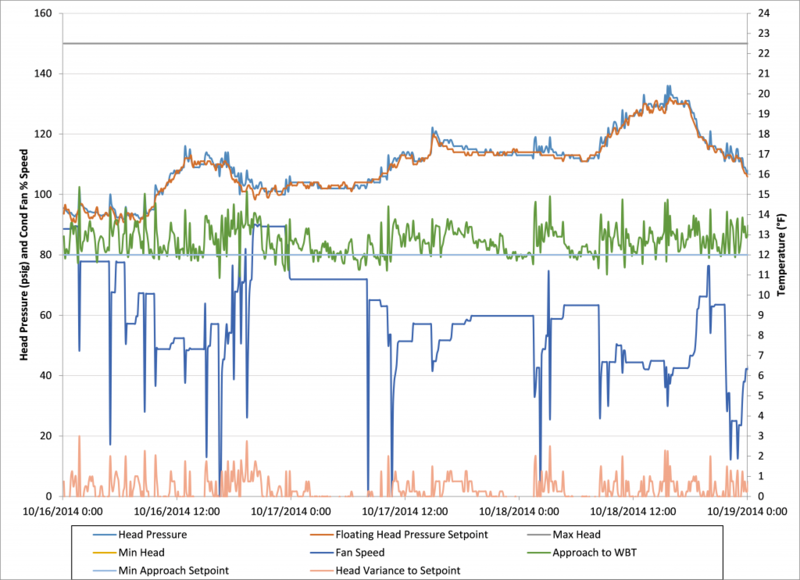 After the change was made, trend data was again observed to determine the new fan power. The figure below shows the operation of the fans with the adjusted approach set point. 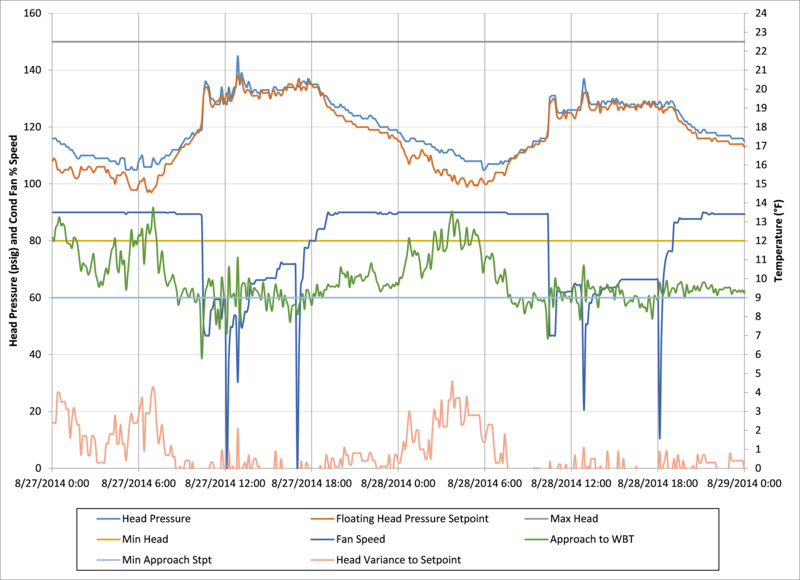 Using the system performance observed, the set point change reduced fan power by 70,836 kWh with an energy penalty at the compressors of 63,106 kWh. The net energy savings for this change are minor, but the findings are a great lesson in optimizing set points.